What Counties & Towns in Ireland Did Our Ancestors Come From? Genealogists know the frustration of tracking down your Irish immigrant ancestor’s birth, marriage or death certificate, hoping that it will be the document that finally tells you where in Ireland your family came from—only to be disappointed once again. So many census registrars simply wrote “Ireland” on the form, giving no additional clues about the town or county. This practice can present a challenge to those of us seeking to locate the towns or counties in Ireland where our Irish immigrant ancestors came from. You can see this problem in the 1892 New York state census, which is online. Here is a typical entry, for the Scully family. The census tells us that the family members were born in “Ireland” and now live in Albany, New York. Credit: “New York, State Census, 1892,” index and images, FamilySearch (https://familysearch.org/pal:/MM9.1.1/X366-VPR. Accessed 21 Mar 2013, Kate Scully, 1892. How are we going to find out exactly where in Ireland the Irish family members were born? Irish American Newspapers! It has been my experience that Irish American newspapers are the genealogist’s most reliable source for finding information about our Irish ancestors’ birthplaces. Will every Irish obituary or marriage record give these details? No—but many of these old Irish American newspaper records do. Let’s turn to historical Irish American newspapers to try and find the birth place of the first Scully member listed in the NY census. 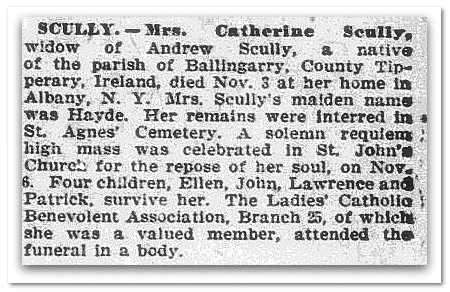 Searching GenealogyBank for references to Catherine Scully of Albany, I found her obituary published in the Irish World News (New York City, New York), 2 December 1893, page 5. Bingo. This old newspaper obituary tells us that she was born in Ballingarry, which is in County Tipperary, Ireland. Now that we know she was born in Ballingarry, County Tipperary, Ireland, in 1846, we can look for images of the Irish town from 150 years ago. The search for images of Ballingarry was easy: Wikipedia has an engraving of a street scene from the town in 1848. What a treasure to have an image of this Irish town from the time when she was born! Illustration: Ballingarry in 1848. Credit: Wikipedia. Hey—could that be her on the right side of this image standing with her father? Every genealogist wants to know exactly where in Ireland—or any country—their family came from. Newspapers are a great resource for finding those family facts. Dig into GenealogyBank’s newspaper archives online and find the details and stories of your ancestors’ lives. My ancestor Alexander Davidson came over from Ireland in 1710 and died in Pa in 1739. I doubt there would be any newspapers that I would find him in. Also my Irish ancestor came over from Ireland in 1811 with his family and I have no idea if there were newspapers then that might mention them. looking for information about the Spradlins in Ireland. I am looking for my family Quesis, (Casey and many others variations (20)) Iam writing from Uruguay. Tanks a lot !!! Gustavo – You’ll want to start with your local government documents. Check out death records, marriage records. 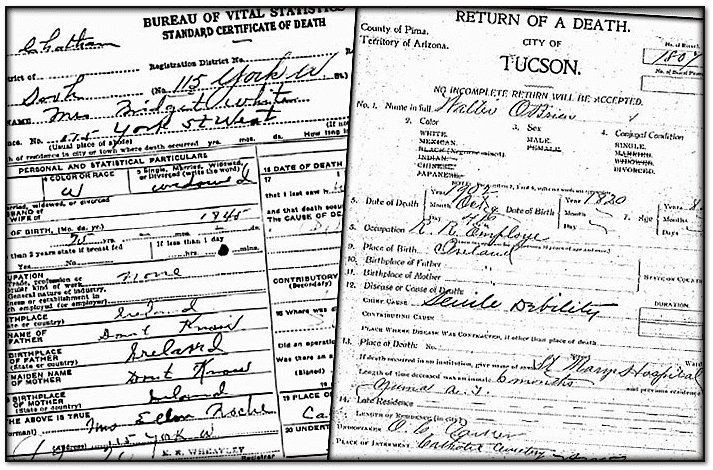 Christening records as well as church records can also be very helpful in finding your ancestors.